Arrived Le Havre, France 28 November 1944. The 87th was moving into Germany when, on 16 December 1944, German Field Marshal Von Rundstedt launched his offensive in the Ardennes forest (Battle of the Bulge). 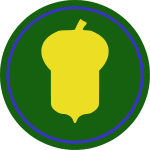 The Division was placed in SHAEF (Supreme Headquarters Allied Expeditionary Force) reserve, 24–28 December, then thrown into the Bulge battle in Belgium, 29 December. In a fluctuating battle, it captured Moircy on 30 December and Remagne on 31 December. On 2 January 1945, it took Gérimont, on 10 January Tillet, and reached the Ourthe by the 13 January. 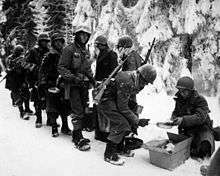 On 15 January 1945, the division moved to Luxembourg to relieve the 4th Infantry Division along the Sauer and seized Wasserbillig on 23 January. The 87th moved to the vicinity of St. Vith, 28 January, and attacked and captured Schlierbach, Selz, and Hogden by the end of the month. After the fall of Neuendorf, 9 February, the division went on the defensive until 26 February, when Ormont and Hallschlag were taken in night attacks. The 87th crossed the Kyll River, 6 March, took Dollendorf on 8 March, and after a brief rest, returned to combat, 13 March 1945, crossing the Moselle on 16th and clearing Koblenz, 18–19 March. The division crossed the Rhine, 25–26 March, despite strong opposition, consolidated its bridgehead, and secured Grossenlinden and Langgöns. On 7 April, it jumped off in an attack which carried it through Thuringia into Saxony. Plauen fell, 17 April, and the division took up defensive positions, 20 April, about 4 miles from the Czech border. On 6 May 1945, it took Falkenstein and maintained its positions until Victory in Europe Day. The 87th Division returned to the States in July 1945 expecting to be called upon to play a role in the defeat of the Imperial Japanese, but the sudden termination of the war in the Pacific while the division was reassembling at Fort Benning changed the future of the 87th. The division was inactivated 21 September 1945. 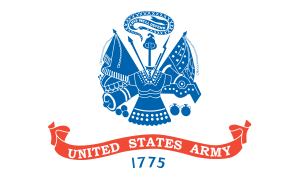 On October 1st, 2015 the 87th Army Reserve Support Command was inactivated.